L-Leucine is an amino acid that is absolutely crucial for muscle-building. 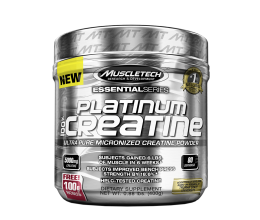 It is one of the three amino acids that compose the complex known as Branched-Chain Amino Acids. L-Leucine is essential to the body, since we cannot produce it internally, and it must be obtained through our diet, or with supplementation. Leucine is found in many sources of protein. However, taking additional leucine via supplementation provides further benefits to bodybuilders, since the leucine in conventional food sources can take a long period of time to be liberated from its original source and assimilated. L-Leucine is essential to bodybuilders and athletes in general, since it is clearly the most anabolic of all the amino acids that make up food protein. It is metabolised in our muscles directly, rather than in the liver, and it has many beneficial effects on sports performance. L-Leucine helps preserve lean muscle tissue, it supplies the body with energy when we engage in athletic activity. It also preserves glucose stored in muscle tissue, necessary to fuel muscular contraction, it maintains nitrogen balance, and it helps heal muscle tissue, bone, and skin. L-Leucine is found in high concentrations in our muscle cells, and it plays a fundamental part in synthesizing protein. Research shows that taking higher concentrations of L-Leucine than the ones normally found in protein sources helps produce more muscle tissue in shorter periods of time. This essentially happens through two mechanisms. First, L-Leucine activates the cells' amino acid sensors, telling our body it has plenty of amino acids available to produce new muscle, and prompting it into doing so. Second, L-Leucine helps to keep the existing muscle tissue, since it hinders the catabolic activity produced during high intensity training. Essentially, L-Leucine instructs the body to optimize protein synthesis, speeding up the muscle development process, and keeps it from breaking down muscle cellsduring intense workouts. This dual approach to muscle development results in significantly faster gains, as hundreds of thousands of athletes have been able to experience over the last years. Now, Prozis Sport brings you L-Leucine Instant, a pure and highly anabolic L-Leucine supplement that will completely change the way your body reacts to training. Experience the power of L-Leucine and recover quicker, gain more muscle, and become stronger than ever. Take 1 serving 45 minutes before workout and another one after workout. Instructions: To prepare 1 serving, mix 1 level scoop (2g) with the desired amount of water or juice.